There are all sorts of critters that baffled early Europeans, probably prompting perplexed exclamations of wonder. Some of them were quite a bit different from what they had seen elsewhere such as the kangaroo and the platypus. Others were a mite confusing because they resembled animals that they knew. One of these is the wombat. People thought it was a kind of badger because of its appearance and burrowing habits. Their burrows are far from simple. It also had mannerisms similar to that of a bear. To add to their confusion, the wombat is a marsupial while the badger is a mammal. While they seem cute and people try to make them into pets, the wild side comes out and they get dumped to fend for themselves — which is very cruel. To protect Darwin, disciples invoke the non-explanation of convergence because they have no plausible model of its evolution. 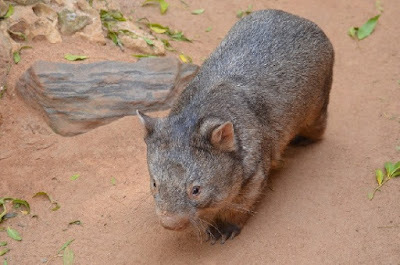 In reality, the wombat is an example of the Master Designer's work. Well equipped with powerful claws and shoulders, reports indicate that wombats can dig through 1.8 metres (6 ft) of hard soil in an hour. They use their incisor teeth to cut through underground obstructions such as roots. The wombat is widely considered an agricultural pest, and not just because of its burrowing habits and its appetite for pasture grass (being semi-nocturnal, it mostly feeds at night). It can also cause considerable damage to rabbit-proof fences when it powerfully pushes its stocky body and wide pelvis through them. Wombats were declared vermin in 1906 in the State of Victoria—and still are, though population control requires a permit. Elsewhere in Australia, wombats are protected by legislation. To read the entire article, click on "The wombat — ‘Badger’ of the south".